Are you performing due diligence on Changyi Aiweite Textile Co Ltd from Shandong China who sells Polyester POY? If so, read on below to read one buyers experience when trying to buy Polyester POY. You will also find some links to help you find more related information about Changyi Aiweite Textile Co Ltd on Supplier Blacklist and on Google as well as other bad suppliers of Polyester POY reported here on SBL. Sir, the above company is neither delivering us goods nor returning our payment. The contact persons are Ms. Luke-131 9188 5624 and Mr. Wang- 171 8549 2020, 0536-8693 6178. Sir, I shall be very thankful and obliged if you could resolve this issue or block this amount with you. Your kind cooperation shall be highly appreciated and obliged most. Need More Info on Changyi Aiweite Textile Co Ltd? If you need more information, you can click the below links to search for more submissions about Changyi Aiweite Textile Co Ltd on Supplier Blacklist as well as go to the search results page on Google for more reviews online about this company. 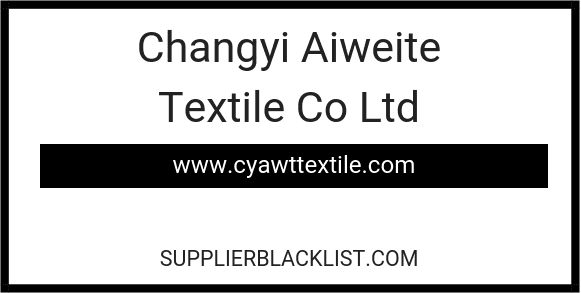 Perform a Supplier Blacklist search for more reviews on Changyi Aiweite Textile Co Ltd.
Search Google for Changyi Aiweite Textile Co Ltd Reviews.